I shot this photo several months ago at Santa Barbara Mission. I felt enchanted by the spears shooting out toward me and my camera. I also love the play of light on the slender leaves inside the plant. I'm unsure what type of flora this is. It appears to have a palm base however many hours of searching on internet palm sites have turned up nothing. 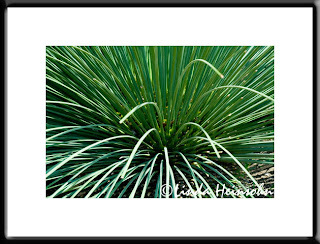 The leaves look more yucca-like though they are spears not slender triangles. They mission grounds may have had this plant labeled somewhere nearby but it was a very hot day and I felt unwell in the heat so I failed to get the name. Anyone who knows what this is, please comment so I can change the title of this post. Thanks!